Your spouse just spent $700 on a new laptop, without checking in with you first. Or maybe you're the culprit, racking up $250 of new credit card purchases last month that weren't in your household budget. Whoever is at fault, such unexpected financial missteps are a leading source of tension in any relationship. But there is a way to eliminate these unwanted financial surprises: regular budget meetings between you and your partner. Holding a weekly or monthly budget meeting doesn't sound like the best way to spend an evening. But such meetings are important. Regular budget meetings can help couples stay on track when it comes to paying off debt, building savings, and stowing away dollars for retirement. "I find that couples who get along the best financially speaking are those who communicate openly and freely when it comes to their finances," said Kevin Murphy, senior financial services consultant with McGraw-Hill Federal Credit Union in East Windsor, New Jersey. "Couples should discuss their goals and set a plan together." Married couples argue about a host of subjects. But financial matters often top the list, which is why a regular budget meeting can make your marriage a happier one. These money meetings increase the odds that you and your partner will be working toward the same financial goals, and that one or both of you won't be overspending on a regular basis. The best news? These budget meetings don't have to be unpleasant. Here are some tips on holding successful budget meetings. Agree to hold your household budget meetings at a regular time, whether it's every Thursday night, every two weeks, or once a month. If you don't schedule your budget meetings as you would any other appointment, life will get in the way. If you're like most couples, you'll sit down to a Netflix movie and blow off the money meeting. Try to aim for meeting once a week or, at the least, once a month. Your partner might imagine a budget meeting lasting into the wee hours of the evening as you both pore over every credit card purchase and ATM withdrawal. No one wants to talk money for hours. Instead, put a set time limit on your regular budget meetings, perhaps limiting the meeting to a maximum of one hour. If you meet frequently enough, 60 minutes should be more than enough time to go over your household finances. Some people are better at sticking to a budget. That's a fact. Partners who make those extra purchases every month might shy away from budget meetings because they don't want to be lectured for an entire hour on their recent financial missteps. Refrain from using budget meetings to blame each other for financial setbacks. Instead, use the time to craft a budget that works for everyone. If your partner is regularly blowing the budget, ask what you both can do to resolve the problem. Maybe your partner overspends each month because your household budget is too tight, and doesn't leave any room for fun or unnecessary purchases. Use your regular meetings to tweak your budget so that it works for your household. A household budget is always a work-in-progress. It's okay, and even advisable, to make regular changes to it. If your household budget isn't working, use your meetings to adjust it so that it does. You'll need actual numbers to hold a successful budget meeting. So print out credit card statements, bank statements, and other important documents. Bring bills that need to be paid in the next several days, too. Armed with this information, you and your partner can make the best financial decisions for the weeks ahead. It's not easy holding a budget meeting when your kids are asking for snacks or your dog is whining for a walk. Finish the household chores before your budget meeting. You want a quiet block of time so you can focus. If your meeting is interrupted by too many distractions, you'll be tempted to cut it short before you address your family's most important financial matters. 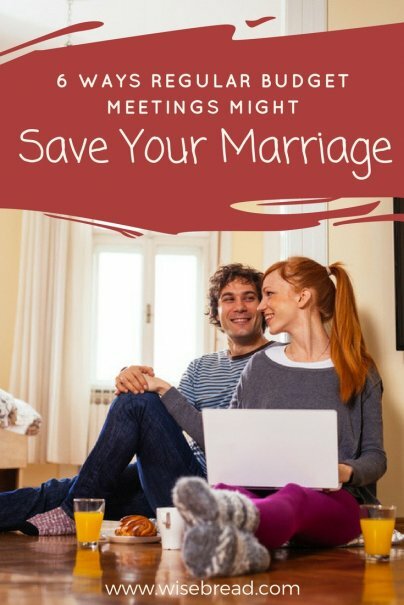 Do you and your partner hold regular budget meetings? We hash out a mutually acceptable budget every November, then meet if a problem arises. The yearly hashing out now revolves around modifying things that didn't work as well as expected or setting new goals. Most of our bill paying is consistent, but it's taken us years to get to this point. We've found if we see the budget as something to conquer together, it strengthens our marriage.